The ultimate guide to Val di Fassa ski holidays in 2019 & 2020. World-famous vistas, fantastic ski links and loveable mountain villages make up the gorgeous Val di Fassa. Nestled in the mighty Dolomites, this is a perfect base for exploring the legendary Sella Ronda circuit – spend long days cruising the slopes before settling down for Italy’s mouth-watering cuisine in a warm, friendly environment. 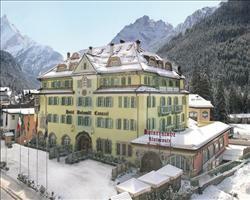 Fassa is nestled in the heart of the Dolomites in North Eastern Italy. A UNESCO World Heritage Site, it’s surrounded by the Sassolungo, Marmolado and Sella massifs – some of the Dolomites’ most striking peaks. Make sure you catch them at sunrise or sunset at least once: the sight of the sun reflecting on the mountains is breathtaking. Made up of 9 ski areas and 7 resorts, it’s a lovely spot for a relaxing week away; as well as a gentle pace on the slopes, the villages have a fun and friendly feel. The valley has kept its charm with traditional Tyrolean architecture housing cosy hotels and chalets. Modern lifts, sports centres and excellent childcare services cater for all kinds of holiday. Like the rest of Italy, Fassa is a foodies heaven where you can enjoy unforgettable Italian classics in numerous huts on the mountains and throughout the villages. Canazei is the largest and liveliest town, with oodles of character and some of the best bars for a post-slope pick me up. The cobbled streets of neighbouring Campitello ooze mountain charm, with the Ischia sports centre a lively hub for activities. Pozza di Fassa is a small peaceful village, made luxuriously unique by the sulphurous waters below - the thermal baths at the Central Termi Dolomiti makes this spa town an idyllic spot. Vigo sits high in the mountains with a direct link down in to the wonderful Ciampic valley whilst with fairy-tale surroundings between the Fassa and Fiemme Valleys, Moena is the perfect base for skiing the Trevalli ski area. Sunny Mazzin is surrounded by the wonderland forest of the Val Udai and you’ll find pure tranquillity in Fassa’s oldest village, family-friendly Soraga. A free ski bus runs through the Valley making it really easy to explore the resorts and discover the Dolomites further afield. The Val di Fassa/ Carezza pass gives access to the smaller, uncrowded resorts of Campitello, Canazei and Pozza for leisurely days of cruising. To clock up more miles and explore the fantastic Dolomites further afield, you can upgrade to the Dolomiti Superski pass. The ski areas here are rarely crowded and the unhurried pace makes them ideal for confidence boosting. Beginners will appreciate the easy-going pace in the area. There are nursery slopes in every village and first-timers will get a great introduction in the hands of the ski schools. Most schools also have children’s clubs with special activities and apparatus to introduce the little ones to the snow. The main ski areas are best suited to experienced skiers with the majority of runs graded red. You’ll find exciting steep verticals on the Marmolada and a number of gentle cruisers at Col Rodella and Alta Badia. The red Panoramica on Buffaure at Pozza is the longest in the valley at 6km - its highlight is in the name, a must-ski for the breathtakingly scenic backdrop. A major highlight here is the Sella Ronda circuit, which covers 4 valleys and 3 provinces – all in under a day. You’ll need to upgrade to the Dolomiti Superski pass and it’s best to set off before 10 so you can squeeze in a few mountain hut pit stops. There are a number of challenging descents for experts - gain speed on the black Aloch at Pozza (night skiing is also held here), ski the steepest slope in Carezza’s black King Laurin (which has a 65% gradient) or enjoy a bit of competition on Canazei’s self-timer run. In terms of freestyle, the Dolomite Park at Belvedere-Canazei is accessible via the Canazei cable-car and the Sanpe park sits at 2000m on the San Pellegrino Pass. There’s a border cross at Morea and Lusia located on the southern side and the Christomannos is uniquely located in a UNESCO heritage site. 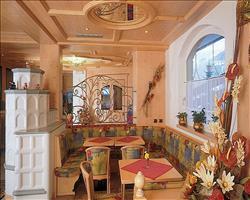 There’s a charming Italian vibe in all the resorts within the valley. Make sure you try the local tipple of choice - the Bombardino. This blend of advocaat and hot brandy is enough to warm every skier. The Grolla is another one to try, this sharing goblet of grolla and espresso will give you an extra little kick on the snow. If you’re looking for a vibrant après scene, Canazei is the place to stay. There’s heaps of lively bars in the centre of the town - ski straight down the home run into Après ski Paradis and head to L’husky for cocktails. Traditional restaurants scatter the mountains offering a delicious taste of the local cuisine meaning food lovers are in for a treat. There’s a huge range of mouth-watering dishes to try including local meats and cheeses; look out for Birramisù on the menu – it’s tiramisu made with beer and it tastes amazing. Restaurants and bars line the cobbled streets of Campitello- its easy going vibe attracts those wanting relaxing evenings, ready for a long day on the piste. Pozza di Fassa is ideal for a week of relaxation, the thermal baths at Central Termi Dolomiti are unique to the area and make the perfect place to wind down in the evening after a long day on your legs. Campitello is home to the Ischia sports centre, this large complex has numerous sports facilities for football, basketball and mini golf and more. The awesome scenery makes it a favourite destination for winter trekking and cross country skiing. There’s also the opportunity to do snow-shoeing and sleigh riding- these can usually be booked through the ski schools or accommodation. When is the best time to ski Val di Fassa? You’re likely to get some fantastic snow throughout the season here with the best snow fall usually seen during the Christmas period through ‘til March. On years when the snow may be a little sparse, snow making technology covers a huge amount of the valley so you should still be able to have long days on the piste. The slopes are known for being free from crowds and having a leisurely, unhurried pace. The resorts may get busier at the holiday times- Christmas and New Year usually see an influx of local Italians, however February half-term is rarely busy as Italians don’t have this week off. When the sun begins to melt the snow away during the spring, you’ll usually be able to jump on the first lift for a morning on the snow and before sitting back to catch some rays on a balcony bar in the afternoon sun. With majestic scenery and quaint alpine charm you’ll love spending an enchanting Christmas in Val di Fassa. Indulge in incredible Italian cuisine and relax by a fire in a cosy mountain bar. Catch one of the dazzling firework displays over the New Year in Val di Fassa. Join in the festivities with the mix of nationalities celebrating the start of the year on the stunning Dolomites. Spend a relaxing week away during February half term in Val di Fassa without the crowds you’ll find in other European resorts. Amazing snow, stunning scenery and a huge range of activities make an unforgettable week on the snow. Enjoy incredible skiing under sunny skies at Easter in Val di Fassa. Hop on the first lift to make the most of the morning snow and settle down in a mountain bar to enjoy the sunshine and panoramas later on. Families will love the laid-back pace of life here – the Fassa Valley’s friendly atmosphere and peaceful surroundings make it ideal for a week of quality skiing. 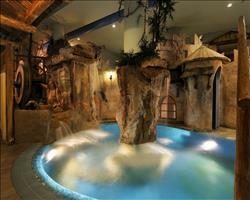 The Italian resorts are fantastic with children and things are no different in the Val di Fassa. All resorts have superb ski schools, with nursery slopes and playgrounds providing an excellent introduction to the piste. Canazei is home to Kinderland, a nursery run by the Marmolada ski school where you’ll find flexible daycare options. Campitello has the Banzimalia winter park by the nursery slope and another Kinderland, both run by the Campitello ski and snowboard school and Pozza’s Ski School Vajolet use the Park Bimbo Neve in Pera. Pozza also has the Pollicino nursery which takes good care of those not yet old enough to don the skis and Canazei has a nursery too. If you don’t mind heading a bit further afield, the Indian Village in Alba di Canazei is well worth a visit, with fun and forgiving obstacles. More experienced tweens and teens will love the snowparks in the valley, Canazei is home to the Dolomiti park and there’s another great Snowpark, the Ston8 in Alba di Canazei. The slopes of the Val di Fassa are brilliant for family days of cruising- predominantly red graded these are best for families with experienced skiers. The slopes have an unhurried pace and are rarely crowded which also makes them ideal for confidence building. The red Panoramica run at Pozza di Fassa is a must ski - at 6km, it’s the longest in the valley and descends amongst breathtaking views. The Col Rodella- Belvedere area also has an exciting variety of terrain and some of the more gentle runs can be found at Alta Badia. There’s an exciting variety within this stunning Valley so whatever type of snowy getaway you’re after it’s unlikely you’ll be disappointed. 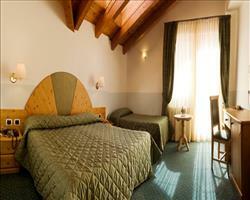 For groups looking to spend long days on the piste and evenings mingling in lively bars, Canazei is the place to stay. Hotels are the main type of accommodation here with a number of fantastic establishments to accommodate any size of group. The Dolomiti Hotel is a good option if you’re travelling in larger numbers, it’s a 90 room property in a top location for the slopes and après activities. Canazei is also an excellent base if you’re a group of experienced skiers looking to ski the incredible Sella Ronda – covering 4 different passes, 4 different valleys and 3 different provinces all in one day, this is an absolute must-ski wherever you’re staying in the Fassa Valley. Natural spa town Pozza di Fassa is lovely and peaceful if you fancy a week of varied skiing followed by chilled out evenings. Stay in the heart of the resort at Hotel San Nicolo to experience the luxurious thermal baths at Central Termi Dolomiti. One of our favourite things about Pozza for groups is the chance of a thrilling session of night skiing on the black Aloch run. Groups looking for luxury may want to browse our selection of top quality hotels in Campitello, The Hotel Rubino executive and Parc Hotel Diamant both offer a quality stay in an idyllic setting with stunning views over the surrounding mountain range. Wellness facilities are available at a number of our hotels and most of the properties have on-site bars making a wonderful area for everyone to catch up and wind down.